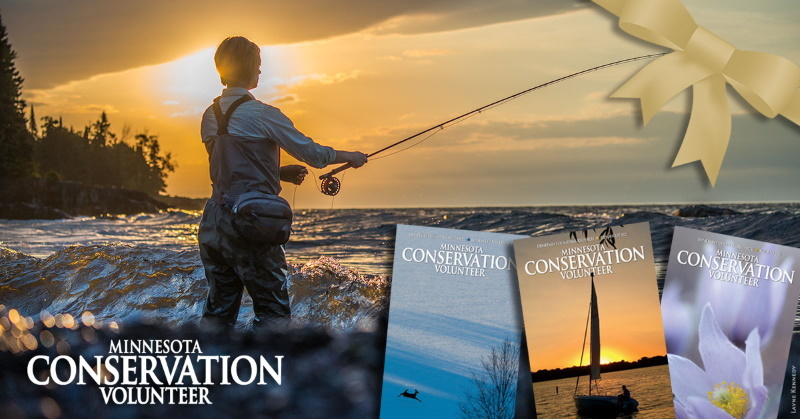 Start or Renew a Gift Subscription of Minnesota Conservation Volunteer TODAY! Your friends and family will treasure your thoughtful gift of Minnesota Conservation Volunteer all year long. Please login or enter your information below. Call 844-245-7115 to add an email to your record. Select State Other - Not Listed Alaska Alabama Arkansas Arizona California Colorado Connecticut District of Columbia Delaware Florida Georgia Hawaii Iowa Idaho Illinois Indiana Kansas Kentucky Louisiana Massachusetts Maryland Maine Michigan Minnesota Missouri Mississippi Montana North Carolina North Dakota Nebraska New Hampshire New Jersey New Mexico Nevada New York Ohio Oklahoma Oregon Pennsylvania Rhode Island South Carolina South Dakota Tennessee Texas Utah Virginia Vermont Washington Wisconsin West Virginia Wyoming Armed Forces Americas Armed Forces Europe Armed Forces Pacific AP American Samoa Guam Puerto Rico Virgin Islands Please select a state. A beautiful gift card will be sent to you for each gift you order. Each year I’d like to auto-renew the gift subscriptions I’ve ordered.